If you want to look at America’s addictions, look at some of the biggest spenders on Display. We’re addicted to celebrity gossip. We’re addicted to sports and political news. We’re addicted to weight loss and beauty. We received pre-approved credit card offers the day we turned 18. There are stories of dead dogs receiving credit cards and toddlers receiving cards with limits higher than those of their parents. …or the shovel that helps us dig our own financial grave. The credit card industry is huge. According to the Federal Reserve Consumer Credit Card Report, American consumers approached one trillion in credit card debt in mid-2016. The average American has between 2 and 3 credit cards. Many have 4+ credit cards. Plus, all of the reward programs, points, benefits, and free travel incentivize us to keep swiping wherever we go. The credit card companies know this. 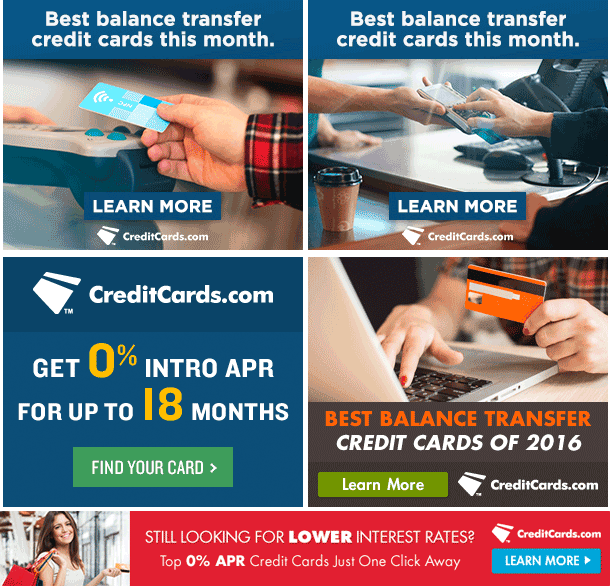 They are in constant competition to one-up each other and offer consumers the “best” credit card, and Display advertising is one of the many channels they use to get their message out. It’s not just the banks and credit card companies that use Display advertising, however. Affiliate marketers capitalize on society’s obsession with credit. These affiliates aren’t a bunch of teenagers getting started. These are savvy, massive companies who are skilled at acquiring millions of dollars in commission through online advertising. Today we’re going to show you exactly how these affiliates make huge commission off of advertising credit cards and other financial products through Display. The nuts and bolts of the credit card affiliate business model are simple. #2: All links are tagged with an affiliate code. However, affiliates do not place the cards in random order. Some cards offer larger commissions. Affiliates give these cards “star treatment” by featuring them higher up on the page. This is completely legal as long as they disclose it. #3: The prospect clicks through to the affiliate link and signs up for the credit card. The credit card company pays the affiliate if the prospect is approved. The commission depends on the card. Most of the “good” cards will offer commission of between $100-$150+ per approved customer. 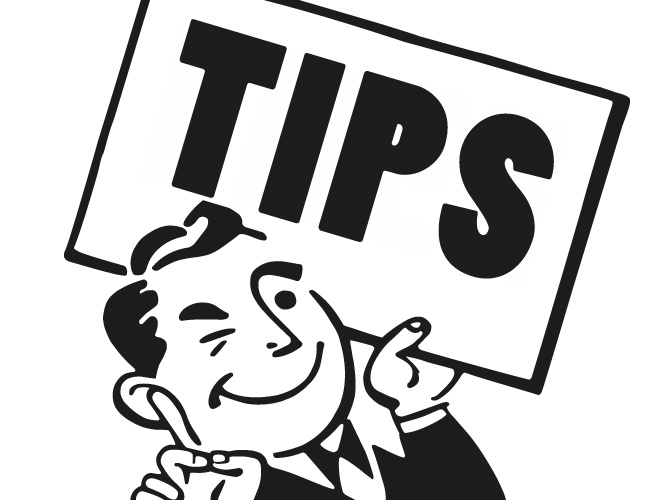 The high commission is one of the reasons why credit cards are a great way for affiliates to make money on Display. However, this isn’t an easy affiliate model to get up and running. The finance industry is ripe with scammers and shysters. Some of the most popular cards will require advertisers to jump through hoops before approving them as an affiliate. In addition, your landing pages, ads, and copy must be compliant with the FTC and each specific ad network’s terms and conditions. This is harder than it sounds, since the FTC and most networks are stricter when it comes to financial products. However, the legal side goes beyond the scope of this post. You’ll have to do your own research on this. It will take a bit of grunt work, but it is quite doable if you’re serious about making this business model work. Let’s see how these companies are spending on Display. CreditCards.com has spent an estimated $2,535,936 over the past 6 months. The majority of their ad spend has been allocated to the Google Display Network and Yahoo! Gemini. 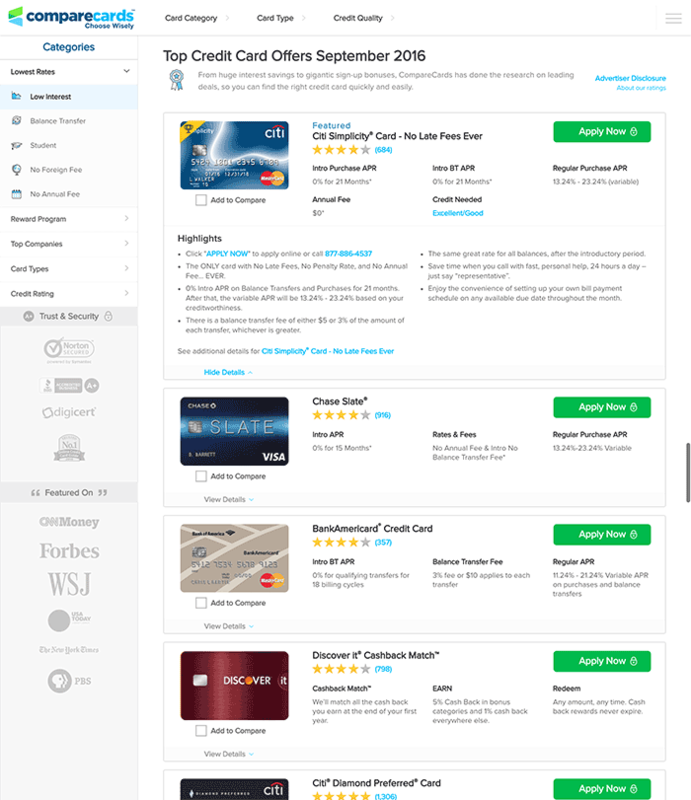 Again, very general sites seem to be working well for credit card affiliate offers. 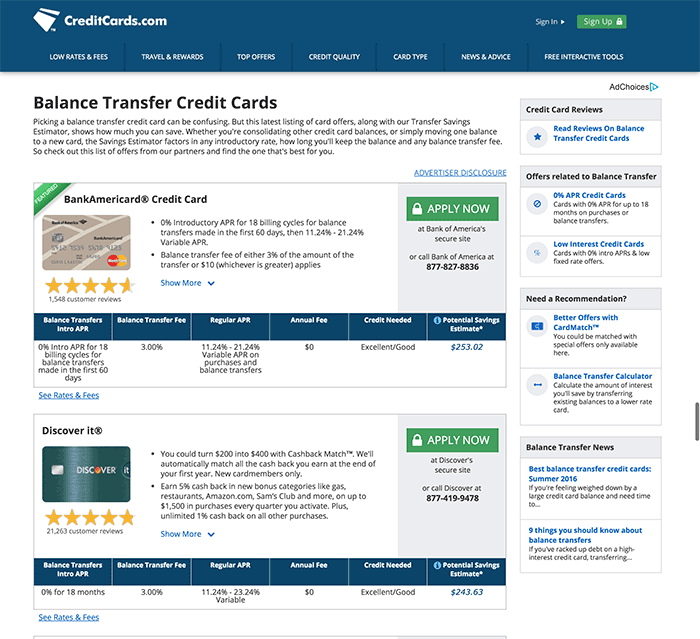 CreditCards.com uses affiliate review style pages targeted towards different types of credit cards. Both pages are very similar. The only difference is the cards shown on each page. 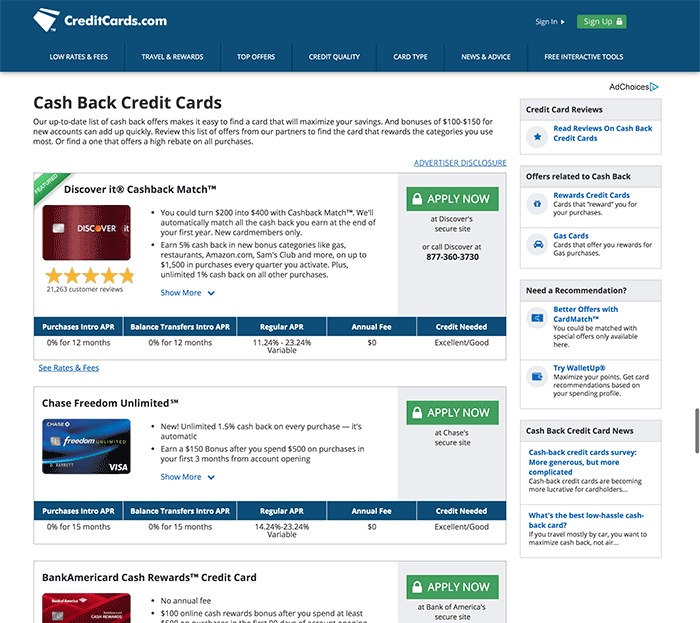 However, CreditCards.com is not using any advertorial style pages. This is probably because they are not testing out Native ad networks. Compare Cards has spent an estimated $1,158,912 over the past 6 months. Compare Cards allocates almost all of their entire display budget across four different Native ad networks. Since the main ad network they’re spending with is Yahoo! 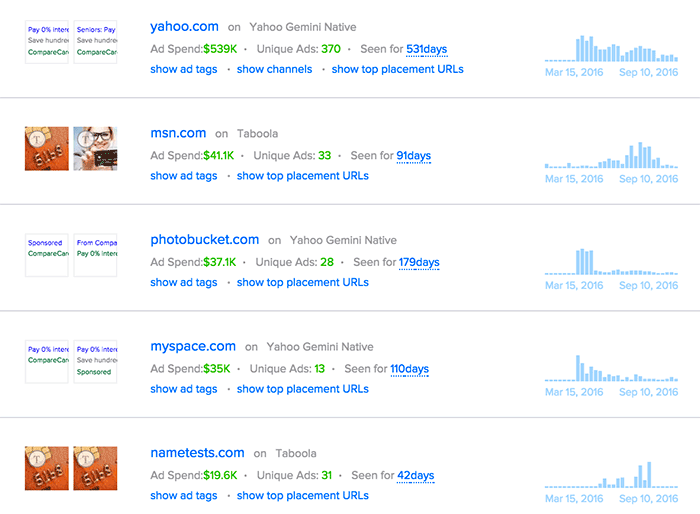 Gemini, most of Compare Cards’ ad spending is allocated to Yahoo.com and other sites that serve ads from Yahoo! Gemini, including Photobucket.com and Myspace.com. What’s interesting is that all of the credit card advertisers so far seem to succeed with very general pages. With some tiny exceptions, there are very few advertisers that are running ads on sites that are directly related to finance or credit cards. These “general” sites likely work because almost everyone in the USA has a credit card these days, and many people have problems with credit card debt. This makes targeting easier since the majority of people will probably find these ads relevant to their specific life situation. Therefore, these general, mass-market sites work. Another way to get an even better look at how your competitors are targeting their specific demographics is to look at the UTM parameters in the URL. Advertisers will often give a general description of their targeting bucket in the URL parameters. For example, Compare Cards’ destination URL for one of their Yahoo! Gemini ads contains the parameter: “utm_campaign=broad_female_18-24.” Therefore, if you’re running traffic to some sort of credit card or finance offer, then you know you can probably start testing out offers to females who are between the ages of 18 and 24. This won’t always be the case, but it’s good to check the destination parameters that advertisers put in their ad creatives. Compare Cards packs all of the bells and whistles that come with each credit card into their ad copy. They also run a few “targeted” ads towards seniors. The only real difference is that they put “Seniors” in the headline. Ideally, the landing page should include a senior citizen inclusive copy (and perhaps pictures), but the quick and dirty way to personalize an ad is to just bluntly say who the ad is for. 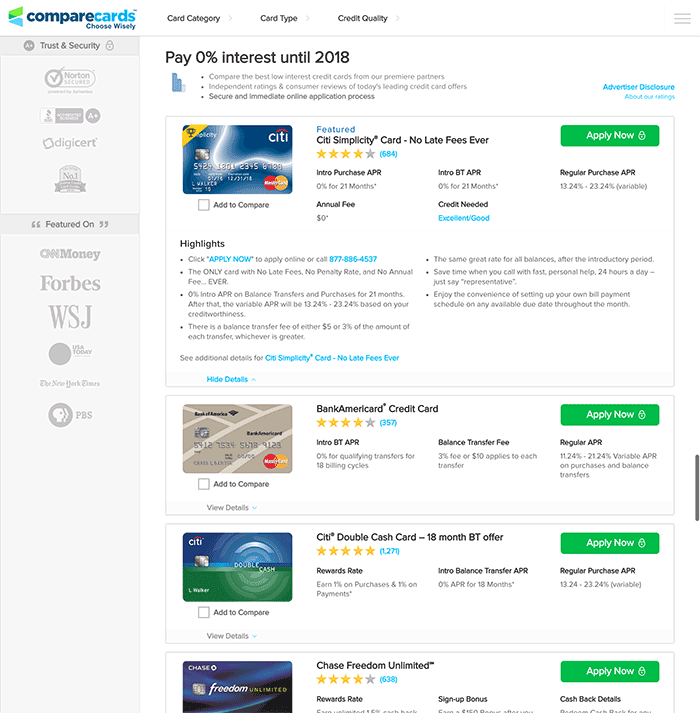 Compare Cards runs affiliate review style landing pages for each type of card they advertise. NerdWallet spends much less on Display than the other companies featured in this post. They have spent an estimated $272,448 over the past six months. Most of their ad spend has been allocated to native ad networks like Taboola. 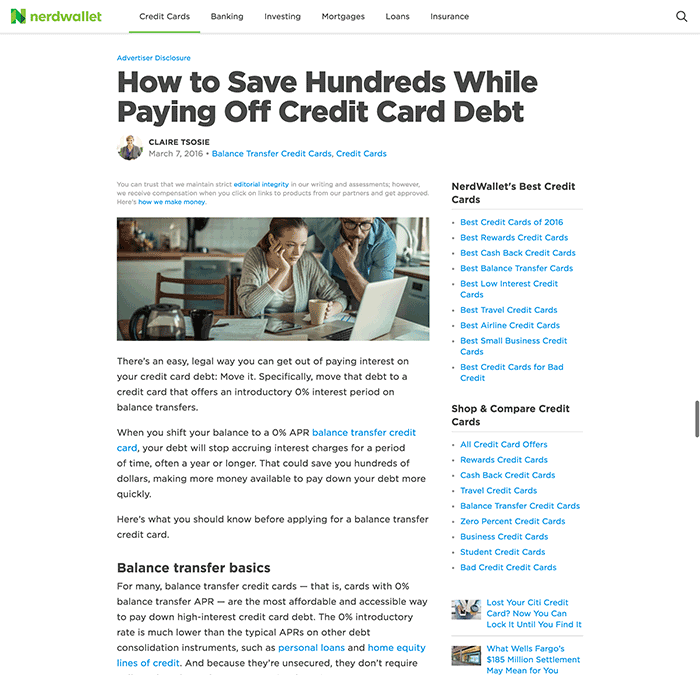 While NerdWallet is spending significantly less than the other advertisers featured in this post, you’ll notice that they follow more or less the same strategy. 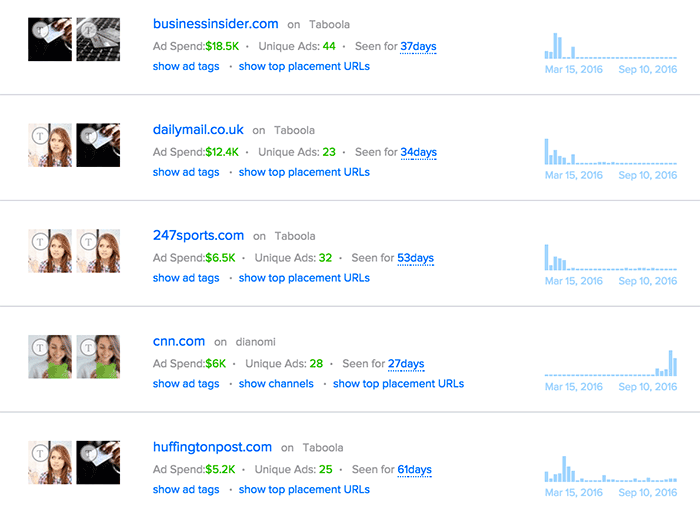 All of their ad spending is spread out over very general publishers. You’ll also notice that they recently started buying inventory on Cnn.com through one of the growing Native networks, Dianomi. NerdWallet uses a mix of ad creatives that contain photos of credit cards or ad creatives with photos of women holding credit cards. Their most seen ad creatives all focus on no interest/balance transfer credit cards. NerdWallet is one of the few advertisers that does not rely on the affiliate review style page. 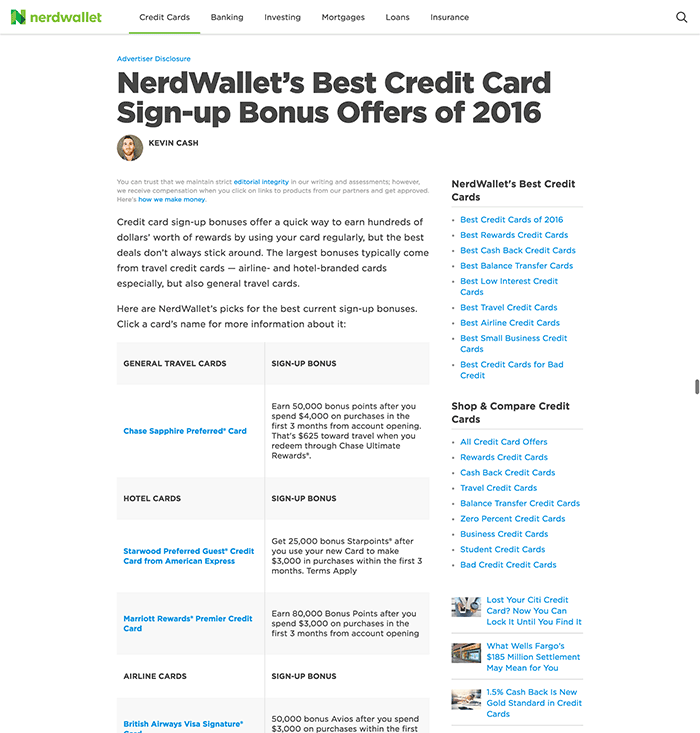 NerdWallet uses advertorial style blog posts that contain a list of the different types of credit cards and offers. You’ll also notice that NerdWallet runs a lot of ads and landing pages related to paying off debt. What is the product that they are promoting? You guessed it: balance transfer credit cards. Here is the main page that they are using. This page contains affiliate links to various credit cards. All of this competitive data is interesting, but it’s nothing unless you know how to break it down and put it to use. Let’s pretend we want to start own credit card affiliate site and advertise on standard and Native display networks. The first place we want to start with is the ad network. Credit card affiliates tend to mainly use Native ad networks and the Google Display Network. I would start first on Native (Taboola and Outbrain), and then test out some creatives on Google Display. You might find it easier to get your creatives and landing pages approved on Native. As far as publishers go, most of the advertisers choose contextually targeted articles and sites. 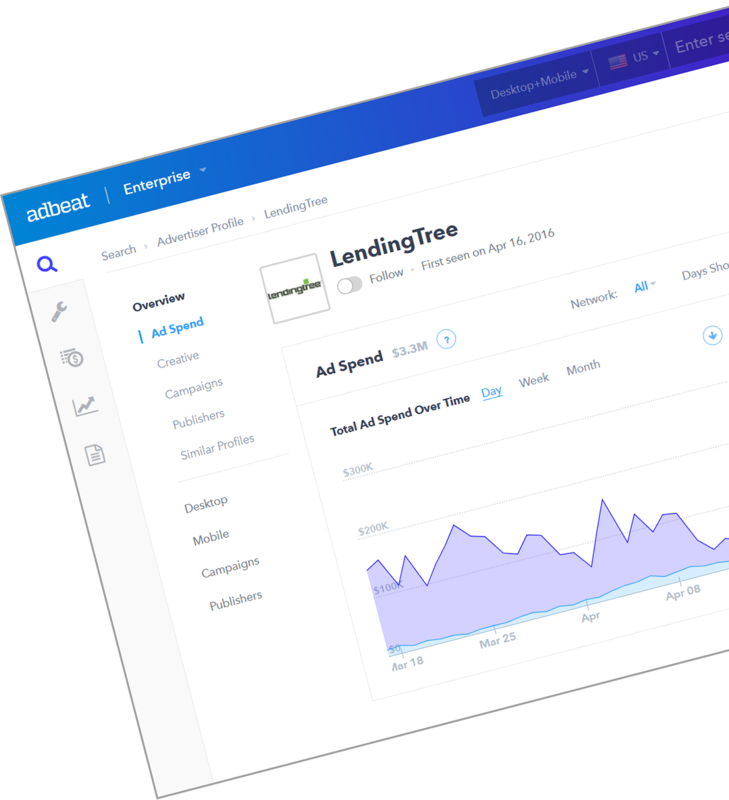 This means that you’ll want your ads to show on pages related to personal finance and debt. You can also test pages and sections on larger publishers and online magazines like Business Insider, Huffington Post, and Yahoo! Finance. These are the two styles of ads that I would start with. As far as copy goes, I’d use copy that is similar to the copy from the ads above. You’d want to test a couple of different angles, including lists and specific cards for a specific purpose (balance transfer, rewards, travel points, etc.). This is probably where you want to start. The next types of pages you’ll want to test are different styles of advertorials. This is a mix of a blog post, advertorial, and affiliate review page. The only advertiser we’ve seen using these pages heavily is NerdWallet. 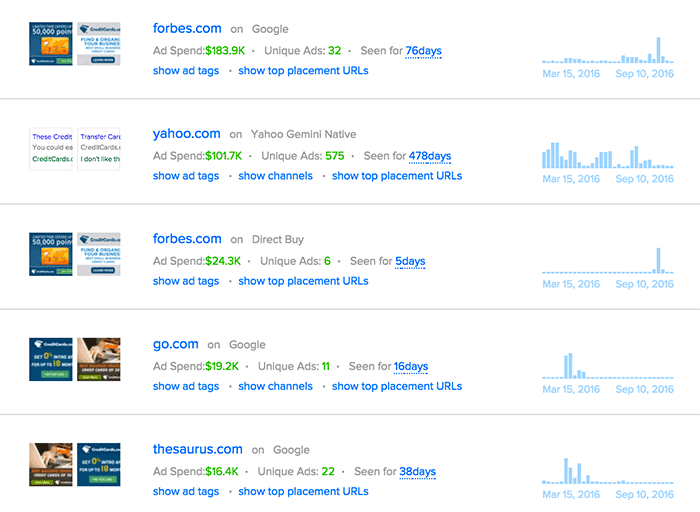 The rest of the advertisers seem to send most of their traffic to an affiliate review page. Admittedly, this is one of the harder business models to get working on pretty much any medium, advertising or otherwise. However, once you get the strategy dialed in, you can create an extremely lucrative business model that eventually expands to other financial markets like mortgage refinancing. The question remains: is the juice worth the squeeze? Only by giving it a shot and looking at all of the numbers can you figure out if this is the right business model for yourself. Another great article. Tough niche for sure. Legalities. I don’t think this is an easy niche but it’s surely very profitable.. Thanks Brad.